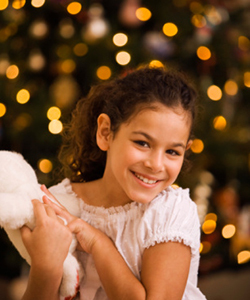 The winter holidays can be a child’s favorite time of year — snow, days off from school, gifts, favorite foods, family. 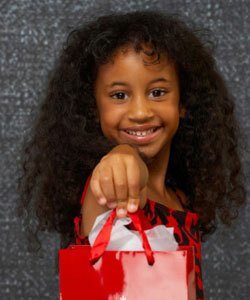 But it can also be a nightmare for snarls, knots and holiday accessories with kids’ curls and waves too! If your child isn’t used to new styles and wears the same head band every day, the holidays are a great time to change things up a bit! First off, prep your kids’ curls and waves with products made just for them. Specialty brands such as Curly Q’s, Ouidad KRLY Kids or Circle of Friends are a bit more gentle than products formulated for adults. Encourage a regular curl routine with your children as well. Style their curls or waves with your fingers or a wide tooth plastic comb. If your child is old enough, show him or her just how to use the products and comb and explain why this is important. Encourage these skills early on. 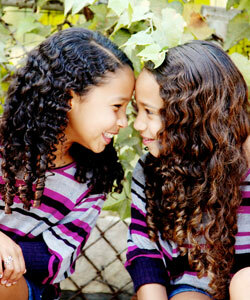 Don’t allow them to use brushes or wash their curls too often, and have their ringlets trimmed when needed. Once your “regular” practice is established, it’s time to shop for some holiday hair accessories. Look for colorful and glittery headbands, bows and clips. You can even make it a craft lesson and create your own, unique hair accessories at home with some ribbon, hot glue gun and clips or plastic head bands from your local dollar store. Find unique beads or metal-toned embellishments to add to your hair accessories and allow your child to show their holiday creativity — along with your help and guidance, of course. As you work with your child to buy and make curly hair accessories for the holidays you can also create a bit of a learning opportunity as well. Point out holiday colors and patterns, designs, etc. Make shopping into a “treasure hunt” by printing out photos of items you’re shopping for, or colors to match their dresses and outfits that will be worn with their special hair accessories. Award them with something sweet, a favorite bubble bath or new bed time story. Holiday curls for kids can be a time for something new or a more “traditional” look, accompanied with a dressed up headband or fancy clip. You may even want to take the holiday opportunity to create an annual tradition of making something special with your little ones that they can help create, wear and collect.